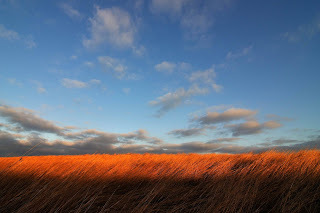 "Beautiful Nebraska peaceful prairie land..."
This is a picture I recently took from Allwine Prairie. Once again I was the only one there. But with good reason. 20 degrees at best and a 20 mile an hour wind. Ouch. I was suffering for my art. I really love the prairie this time of year. The golden tall grass, and deep blue sky really is very romantic...if you can stand the cold. Very striking photo. Any post work on this? Those colors are almost too vivid to be real!! Thanks Dave - and a little post work done - Think it took all of a minute. I really don't do much in post. Mostly because I am old school - meaning - i don't know how. You live here - you know how beautiful it is.